After announcing free Netflix for T-Mobile ONE customers yesterday, T-Mobile has additional news to celebrate this morning. 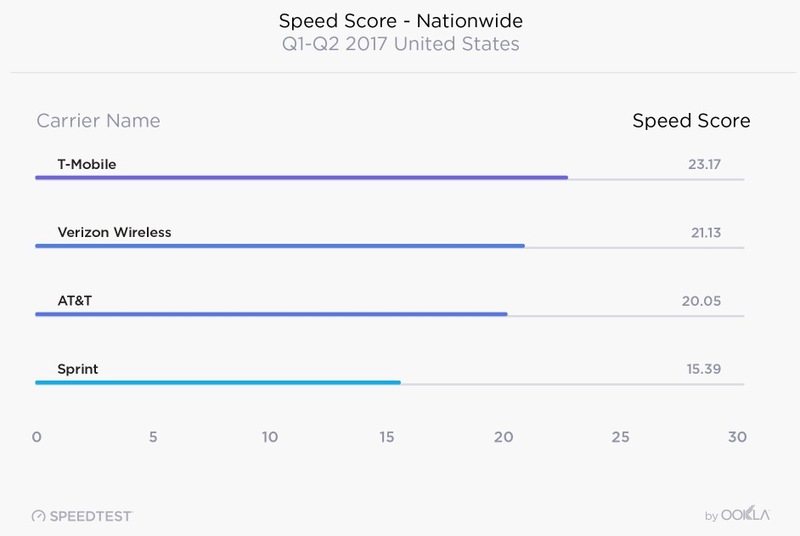 Ookla, the makers of the Speedtest.net app you probably use to check internet speeds on your phone and computer, through their latest Speedtest report, crowned T-Mobile the fastest wireless carrier nationwide for the first half of 2017, topping Verizon. 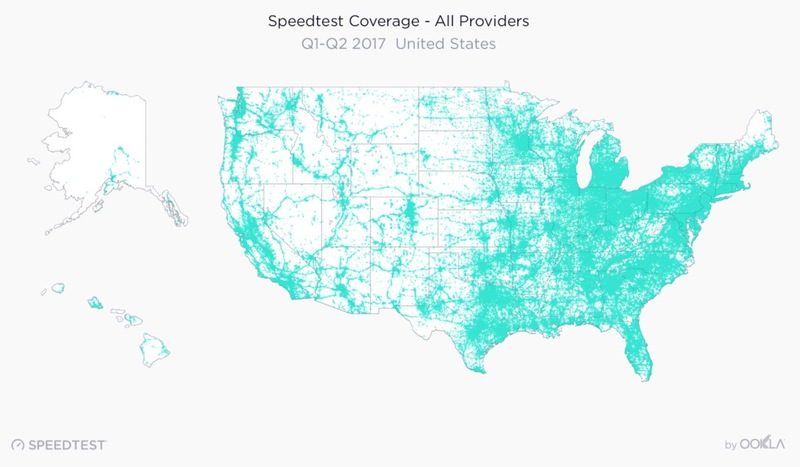 This latest report from Ookla covers speedtests from Q1 and Q2 of this year and shows that overall speeds in the US have increased from 2016 to 2017 by 19.2%. The average download speed throughout the country now sits at 22.69Mbps. Unfortunately, upload speeds haven’t changed much, which should shock no one who subscribers to home internet service that isn’t Fiber. Outside of the nationwide numbers, you probably just care about the individual carrier stuff we mentioned in the opening. And yes, T-Mobile came out on top followed by Verizon, AT&T, and Sprint, in that order. You can see the average download speeds below for each carrier, showing T-Mobile posting speeds almost 8Mbps faster than Sprint, who sits in last place. They eclipsed Verizon by 2Mbps. According to Ookla, they figure the win for T-Mobile amounts to their “tightly-spaced cell site grid and a smaller subscriber base” than Big Red or AT&T, but that their expansion into new markets, while refarming other spectrum to LTE has helped as well. That actually says nothing about why they won and is a promo for their new promo, but OK.
As for Verizon in second place, Ookla notes that Verizon has done a lot of work around “network densification” in order to “maintain solid performance” in high traffic areas. They do specifically point out that Verizon’s performance has taken a hit since relaunching unlimited data plans, something T-Mobile often jokes about. “Our network has never been stronger. Our network philosophy is simple: provide the largest coverage, the most reliable service and the most consistently fast speeds. This makes up the customer experience. “These tests confirm that we have phenomenal coverage across the country, the largest LTE network — roughly 750,000 square miles more coverage than T-Mobile — and great speeds. While these crowd sourced tests don’t show how reliable a network is, other scientific studies do – and Verizon is the clear leader. Ookla also noted that AT&T’s performance has suffered from their unlimited data plans, though they have seen an uptick in performance recently, thanks to LTE deployment in the 2300MHz band. For Sprint, even with the 4th place ranking, Ookla sees “significant improvements” compared to last year and should see things only improve further going forward. 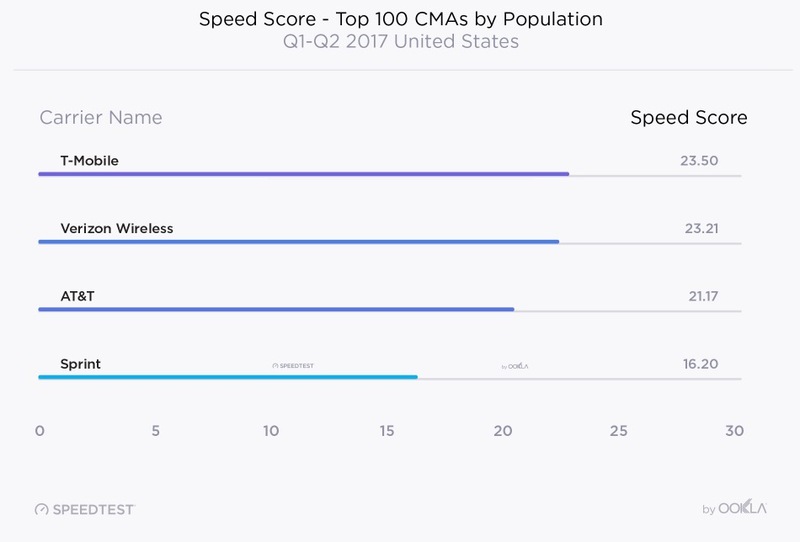 As for other bits of info from this report, T-Mobile took the win in speed scores taken from Cellular Market Areas (CMAs), which are the top 100 most popular areas in the country. Of the 100, T-Mobile posted the highest average score in 40 markets, Verizon took the crown in 35, AT&T in 20, and Sprint with just 5. Here are the average download speeds from those big 100 markets. In the end, this latest report from Ookla shows a lot of what we’ve seen over the past two years – T-Mobile getting better in a hurry while the others seem to be standing still. That’s not to say that Verizon or AT&T have a terribly run networks, they just jumped out to such an early LTE lead that T-Mobile’s catch-up is so noticeable. For us, we can only hope that Verizon and AT&T get sick of T-Mobile topping charts and bragging up the joint, and start getting back to improving things too.